Unisex long sleeve polo shirt. Pique knit with long sleeves and ribbed cuff. Unisex long sleeve polo shirt. 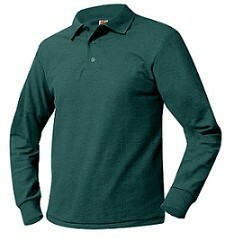 60% Cotton 40% Polyester Pique knit with long sleeves and ribbed cuff. Embroidered with school logo.